Table of Contents Next: Nicholson, Cameron G.G. Nichols Field (121.02E 14.51N) was located just south of Manila in the Philippines. 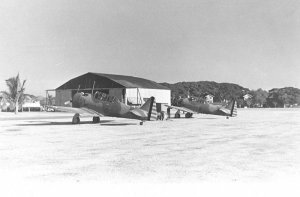 The field based 17 Interceptor Squadron and 21 Interceptor Squadron with 36 P-40E Warhawks when war broke out in the Pacific. These squadrons avoided the debacle at Iba and Clark Field but were unable to stem the Japanese aerial onslaught.